Chief town of the district of Dolschi; ancient capital of the Banat of Oltenie, Lower Wallachia. It may be assumed that Jews settled here at a very early period, some, doubtless, under Ladislaus Basarab between 1365 and 1367, after the expulsion of the Jews from Hungary by Louis the Great. At the beginning of the seventeenth century there was an organized community with a rabbi at Crajova. Many Jews coming from Turkey on business, settled in the city, and when Oltenie came under Austrian rule, in 1718, the community was probably augmented by new arrivals of Austrian and Hungarian Jews. The letter of privileges granted to the Bulgarian colonies (Oct. 1, 1727) by Charles VI. of Austria, forbade the Jews, as well as the Turks and the Greeks, of Crajova to display their goods at the fairs held in the city, the great annual fair being excepted. But when Oltenie again became part of Wallachia, in 1739, the privileges accorded to the Bulgarians were withdrawn, and the Jews of Crajova were once more free to ply their trades. 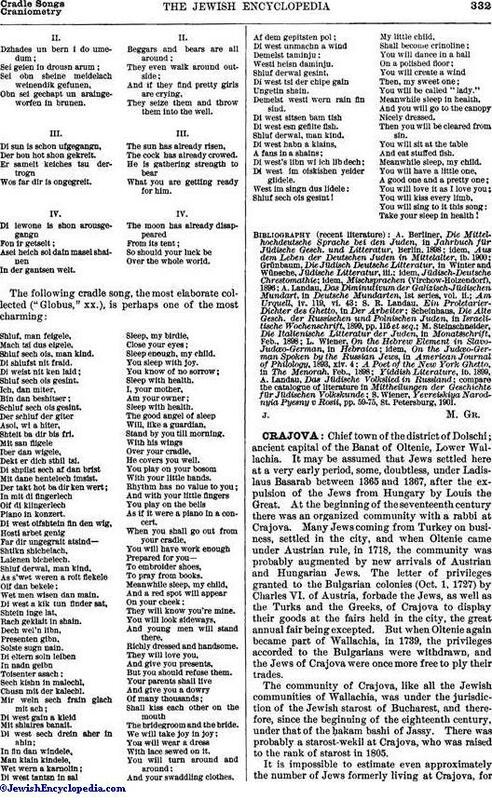 The community of Crajova, like all the Jewish communities of Wallachia, was under the jurisdiction of the Jewish starost of Bucharest, and therefore, since the beginning of the eighteenth century, under that of the ḥakam-bashi of Jassy. There was probably a starost-wekil at Crajova, who was raised to the rank of starost in 1805. It is impossible to estimate even approximately the number of Jews formerly living at Crajova, forWallachia suffered greatly during the wars between Turkey and Austria, especially from the incursions of the bashi-bazouks and, later, from the armed hordes of Pasvant-Oglu. These inroads always forced the inhabitants of Crajova to disperse and seek refuge either beyond the Danube or beyond the Carpathians. 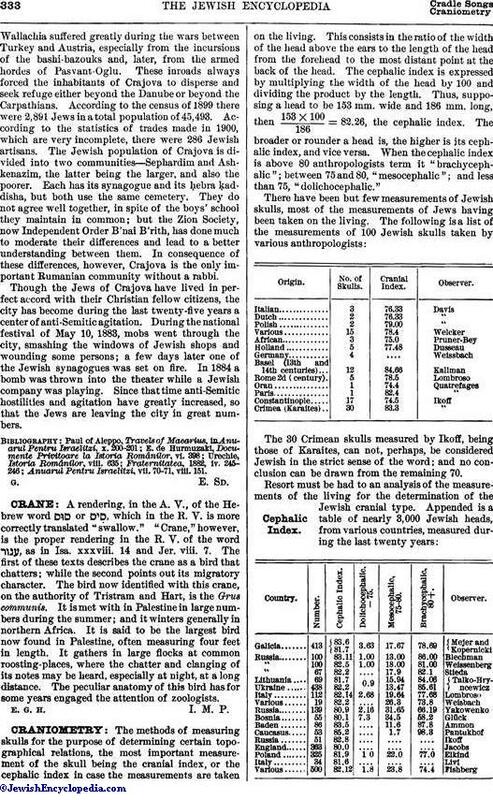 According to the census of 1899 there were 2,891 Jews in a total population of 45,493. According to the statistics of trades made in 1900, which are very incomplete, there were 286 Jewish artisans. The Jewish population of Crajova is divided into two communities—Sephardim and Ashkenazim, the latter being the larger, and also the poorer. Each has its synagogue and its ḥebra ḳaddisha, but both use the same cemetery. They do not agree well together, in spite of the boys' school they maintain in common; but the Zion Society, now Independent Order B'nai B'rith, has done much to moderate their differences and lead to a better understanding between them. In consequence of these differences, however, Crajova is the only important Rumanian community without a rabbi. Though the Jews of Crajova have lived in perfect accord with their Christian fellow citizens, the city has become during the last twenty-five years a center of anti-Semitic agitation. During the national festival of May 10, 1883, mobs went through the city, smashing the windows of Jewish shops and wounding some persons; a few days later one of the Jewish synagogues was set on fire. In 1884 a bomb was thrown into the theater while a Jewish company was playing. Since that time anti-Semitic hostilities and agitation have greatly increased, so that the Jews are leaving the city in great numbers. Anuarul Pentru Israelitzi, vii. 70-71, viii. 151.